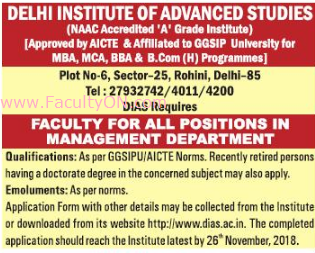 Delhi Institute of Advanced Studies, New Delhi has advertised in THE HINDUSTAN TIMES newspaper for the recruitment of Teaching Faculty (all positions) jobs vacancies. Interested and eligible job aspirants are requested to apply on or before 26th November 2018. Check out further more details below. About College: Delhi Institute of Advanced Studies, an ISO 9001:2015 certified institution, affiliated to Guru Gobind Singh Indraprastha University, established by Shri Laxman Dass Sachdeva Memorial Educational Society. The Institute offers MBA, BBA & B.Com(H) programmes and is providing dynamic learning and growth oriented environment that is changing in response to the changing needs of society. How to Apply: Interested and eligible candidates are requested to send application in prescribed format (can be downloaded or collected from college office) along with copies of certificates and testimonials to the postal address given below. New Delhi - 110085, India.